Chorizo in Spain is not like the chorizo you used to be able to buy in England – it was the hard, dry variety, rather like a little salami. In Spain chorizo is sold fresh – it looks like a bright red sausage and if you buy it at the butchers it’s sold in strings. You will be asked if you want it “fresco o seco” “fresh or dry”. The fresh variety is like a recently made sausage and is for cooking on the “plancha” or in a pan. The drier will have been made a few days or weeks previously and can be sliced and eaten as it is, in the same way as a salami. It’s typical to buy a good supply and then hang some up for eating later and cook the fresh chorizo. I’ve noticed that in England, in some butchers at least, they are coming up with some wonderful and authentic tasting varieties of fresh chorizo, but if you can’t get hold of any, use your favourite sausage and add a little spicy pimentón to give it a warm Spanish taste. This is a very typical dish served as tapas, with or without the addition of the onions. As we were still working our way through the onion glut, I did it with onions! Slice each chorizo into 4-6 pieces and fry in a little olive oil until the outside is slightly charred. If you are lucky enough to have a terracotta cooking pot, use this as it really does add something special to the flavour. Remove the chorizo and put to one side. Add the onions to the olive oil (and the chorizo will also have released some oil) and if you are using it, add a little pimentón. Fry the onions until they start to soften, but not caramelize and then add the wine. 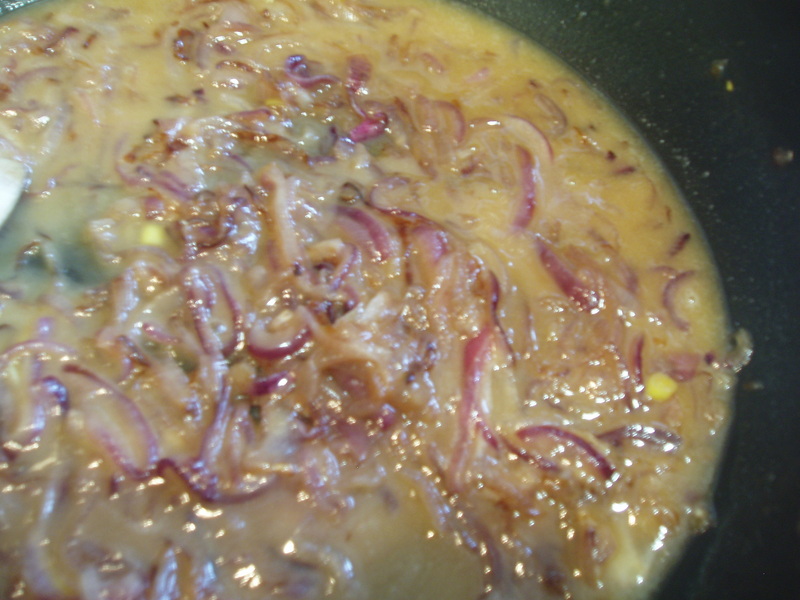 Cook until the liquid has almost completely disappeared and the onions are soft and coloured from the juices. Add the chorizo back into the dish and cook for a couple of minutes more until warmed through. Normally you won’t need any seasoning as the chorizo is highly spiced and salted, but check to taste and adjust if necessary. Serve with a glass of ice cold fino and plenty of delicious bread. What a funny expression that is. I struggled to find a decent explanation for it, although we use the expression to mean “knowing a lot about a subject”. If anyone can enlighten me, I’d love to know more! Over on the beautiful prairies of the Midwest of America, our very dear friend Celia goes along each year to a big swapping fiesta. She usually comes home with some exotic and adorable creature like a white peacock or beautiful Boo the dog. Here, swapping is rife but generally restricted to gluts of fruit and vegetables and also poultry and eggs. As we’re not around so much right now, we can’t offer much but our dear friends and neighbours are busy keeping us supplied with delicious goodies. Yesterday Big Man said he was popping out to see a man about some onions, as you do, and this is what he came home with. A lot of onions. And we’re due to be heading back to England in about a week, so there’s no way we can pack them into the car…we’d be asphyxiated by onion fumes. Time to get creative with onion recipes. Well, there’s Up the Mountain Onion Soup, of course. And maybe a caramelised onion tart. How about something different? Memories of my godmother, who came from the north of Italy, near Venice, and her method of cooking tiny onions in balsamic vinegar inspired me. I’m not sure if it’s exactly her recipe, but the taste was very similar and definitely worth buying onions to make specially. 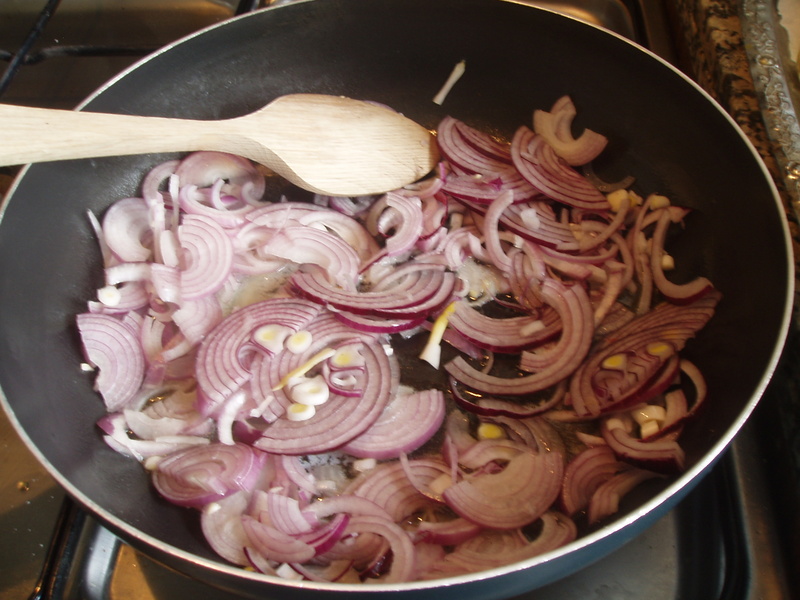 Chop the tops and bottoms off the onions so that they will sit flat in a deep frying pan or saucepan. Season with salt and pepper, drizzle over the balsamic vinegar (I used about 2 tablespoons for approximately a dozen onions), the same quantity of olive oil and pour over a glass of wine. I used Vino del Terreno (this translates as Wine of the Earth or Terrain) which is a wine many of our neighbours produce, a little rough and slightly sweet but oh so good with salty food. Scatter over the herbs and cover tightly with a lid or foil. Bring the pot to boiling point and then reduce to the lowest heat possible and cook gently, turning the onions once or twice, for about an hour. Just before serving, remove the lid and turn up the heat to reduce the delicious cooking liquid slightly. We ate these onions hot as a side dish but they would be delicious served at room temperature as a tapas or starter. And just in case you don’t like wine but do like dogs (clearly not braised in wine and balsamic vinegar) here is a completely gratuitous shot of my pups Luna and Alfi hoping I don’t notice they are hogging the sofa. I wonder where dem birdies is? De little wing is on de bird! Apologies, but I do enjoy nonsense and nursery rhymes! Yesterday at 6.14am, Spring officially began here in Spain. Unfortunately someone forgot to tell the weather and the warm temperatures we have been experiencing dropped overnight. No matter, we have been putting some early plants into our veggie patch, but Big Man has been creating mini polytunnels to protect them on cold days and nights. In about a week we´ll be eating our first broad beans, and the onions are also coming on nicely. We planted a totally ridiculous 280 cloves of garlic, and are now planting lettuce between the rows. Big Man will cover them with netting or the little sparrows will think they´ve been invited to a Michelin starred restaurant. We planted a first “wave” of tomatoes, peppers and chard. The tomatoes are already producing flowers. The chard is almost ready to start picking. But helpers are thin on the ground here. Better to sleep in the warm sun room. Luna says "Just five more minutes and then I´ll come and help"
Maybe I´ll get up and help. Maybe not, I´ll just put my head down and no one will notice I´m here. And a final piece of “newness”. John From the Bartolini Kitchens, very kindly sent me a fantastic tutorial on how to insert the Flag Counter I now have right at the very bottom of my blog page. If you scroll down, down, down you will see that it is now starting collect flags from the countries that have visited my blog. Very interesting and a lot of fun to check up on. Maybe one day I´ll get to visit more of them. Thanks John, my brilliant long lost Italian cousin! 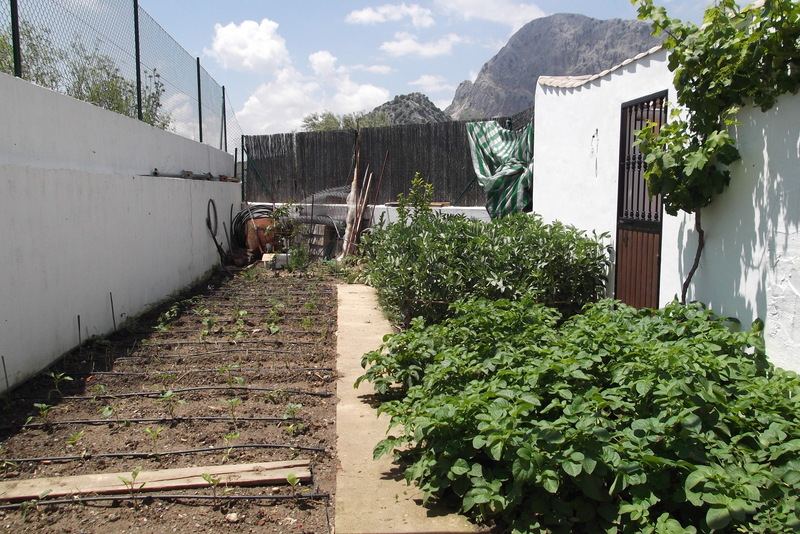 It´s been such a long time since I talked about the garden or the vegetable patch. Naturally, it´s still winter, the soil is resting. But not quite. It´s been an exceptionally mild winter, and while things could still change, there are signs of life. My cyclamen, bought before Christmas, continues to stun us with its beauty. I am doubly shocked as I generally manage to kill pot plants within a few days. What do I do next with it? It currently sits inside our sun room, with the door open all day and sun in the afternoon. It seems very happy. Some of our geranium cuttings are already producing little flowers. Daffodil and narcissus bulbs planted last year (bought back from the UK) are flowering. My parsley survived the winter outside, this is the first year this has happened. Broad beans and onions in their little winter shelter. We open the door and let the sun in during the day and we´ll be eating beans again in a few weeks. Plenty of garlic for the year ahead. I thought it was only a month away from being ready, but wise old Big Man tells me I need to be much more patient. In the background one of our lemons and our artichoke plants which are already producing baby artichokes. 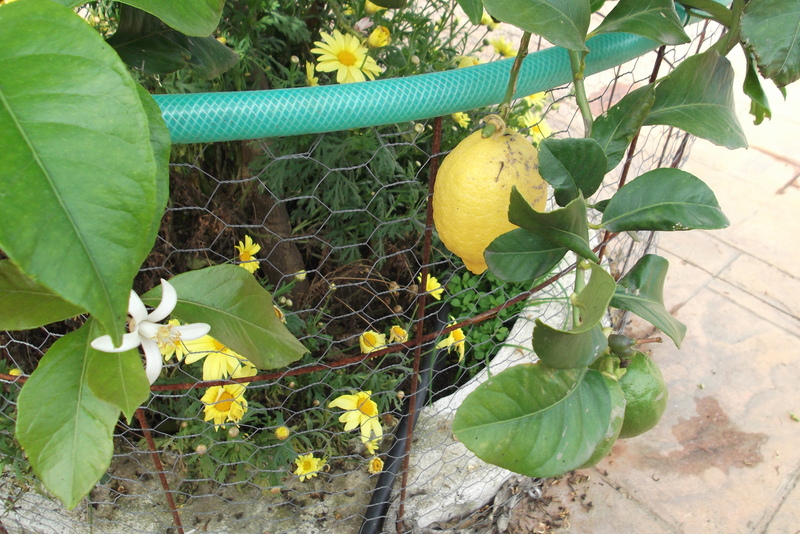 Our other lemon took a battering in the recent high winds, but still has plenty of lemons and produces new flowers with each new moon. We don´t tend to grow our produce from seeds as many of Big Man´s family do this on a large scale for a living. We are going to risk some early planting. Nothing to lose, we think. Basil, thyme, chard, spinach, frying peppers, bell peppers, some more lettuce and some salad tomatoes. Winter has been kind to us this year. Fingers crossed it won´t take us by surprise in the next few weeks. Now that we are starting to have a little drop in temperatures during the day, and a nip in the air first thing in the morning and last thing at night, we know that autumn is just around the corner. While this means saying a gradual farewell to summer, it also means an autumnal welcome to the next season and the food and change in cooking it brings. Off out for a busy morning and knowing I was not going to be in the house while it was still relatively warm, prompted me to cook the first casserole for a long time. We came home to delicious chicken, vegetable and brothy smells and apart from opening the wine and grabbing the loaf of bread left for us earlier that morning on the gate by Bread Man, there was nothing more for us to do other than set the table and enjoy lunch. The dish was a celebration of almost the last of many of our summer vegetables. The bobby (french) beans finally started producing yellow as well as green beans, with kilos of them stored in the freezer for the months ahead. 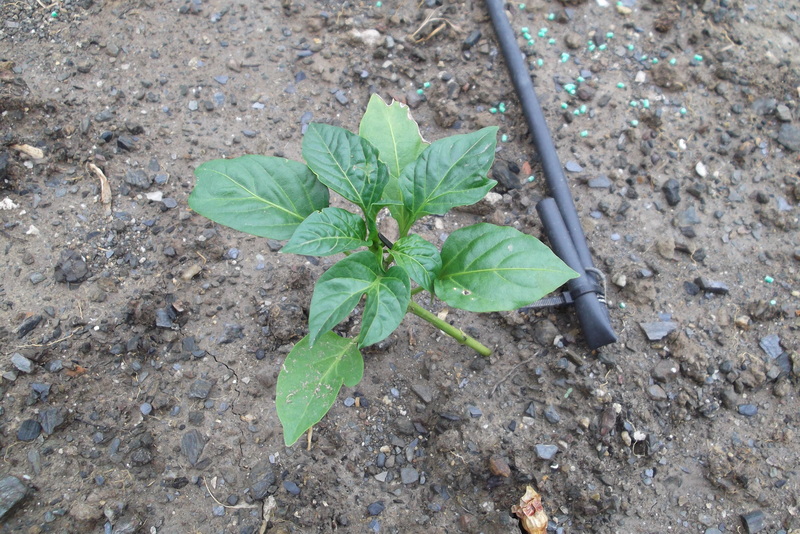 The green peppers are still doing well, we´ll see how much longer they last. Our onions have dried out nicely and are sweet and delicious and I had been hoarding the last handful of potatoes we had left from our first ever potato crop. Into a big pot went two large legs (drumstick and thigh) of our free range chicken, some chopped peeled potatoes, large chunks of courgette given to us by a neighbour along with some whole unpeeled garlic cloves. A few chopped green peppers, a roughly chopped onion, a few handfuls of green beans and some seasoning finished off the ingredients. I covered everything with water and bought it to the boil then put a lid on the pot which then went into a very low oven for about 5 hours. You could, of course, cook it much more quickly on the stove top with equally good results if you´re not off out shopping for the morning! 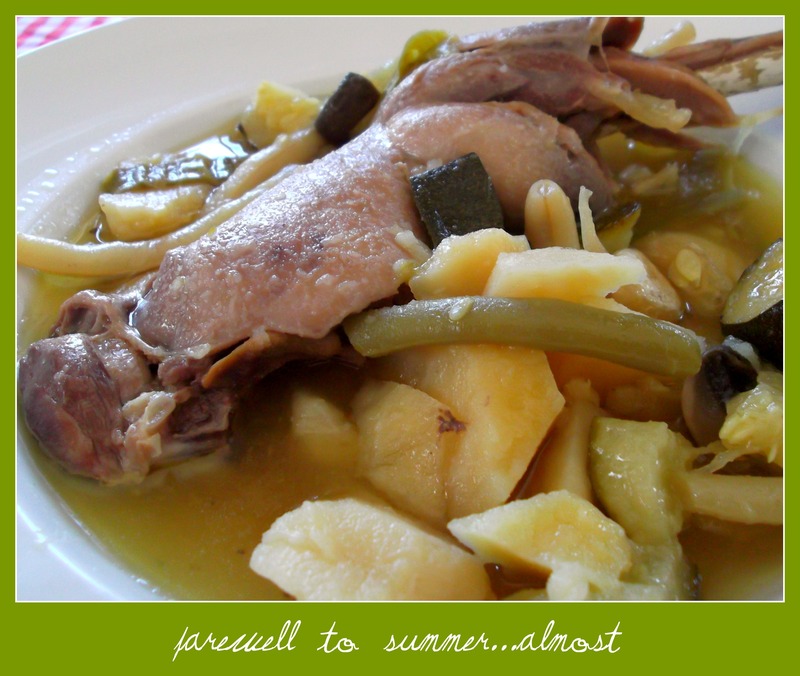 And that was it…memories of summer and anticipation of autumn all in one delicious bowlful. Am off to London to visit my family tomorrow for a week. Will try to keep up with all your lovely blogs and posts, but apologies if I can´t always comment. Looking forward to a proper catch up when I return! It was another day for Fish Man to visit and I bought a kilo of mussels. Such a bargain food, so easy to prepare, and such a wonderful taste. I have been inspired by some of the recipes posted by Olives and Artichokes here and here and often make a tomato based soup version, as you can see here. Today, I decided to use up some of my bacon from the UK, although I could have used lardons or jamon instead. 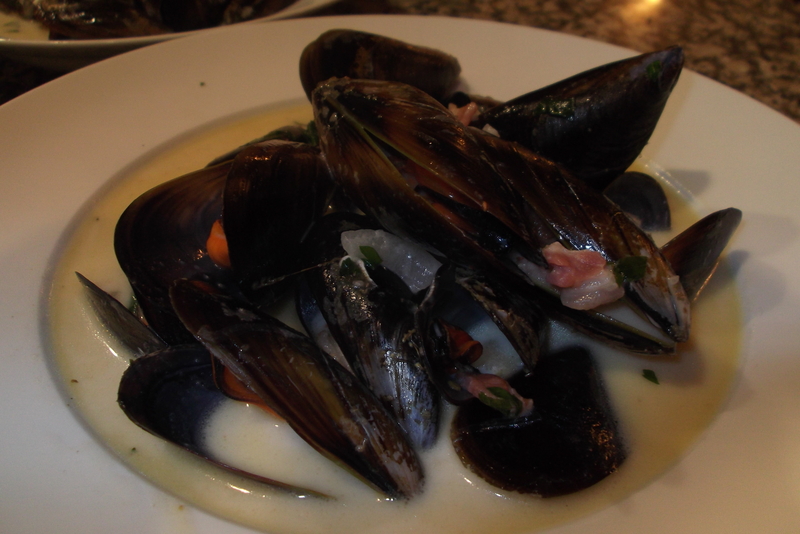 After cleaning my mussels, I lightly fried in olive oil two cloves of crushed garlic, one onion fairly finely chopped and 4 rashers of chopped bacon. 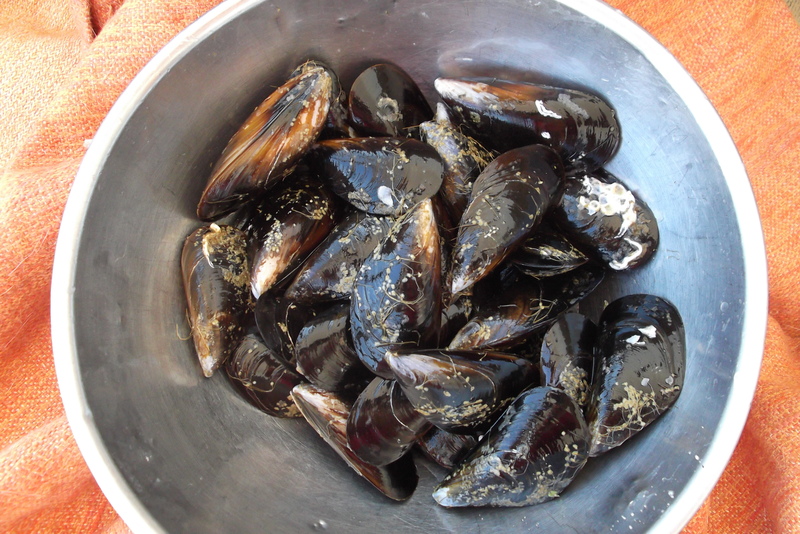 When these had all softened I added a glass of white wine and simmered for about 5 minutes before adding the mussels and a couple of tablespoons of chopped parsley and putting the lid on. A few minutes later the mussels had all opened, so I took the pot off the heat, stirred in 100ml of single or pouring cream and that was it. I served it in big bowls with spoons and crusty bread to soak up all the garlicky, creamy juices. ¡Muy rico! 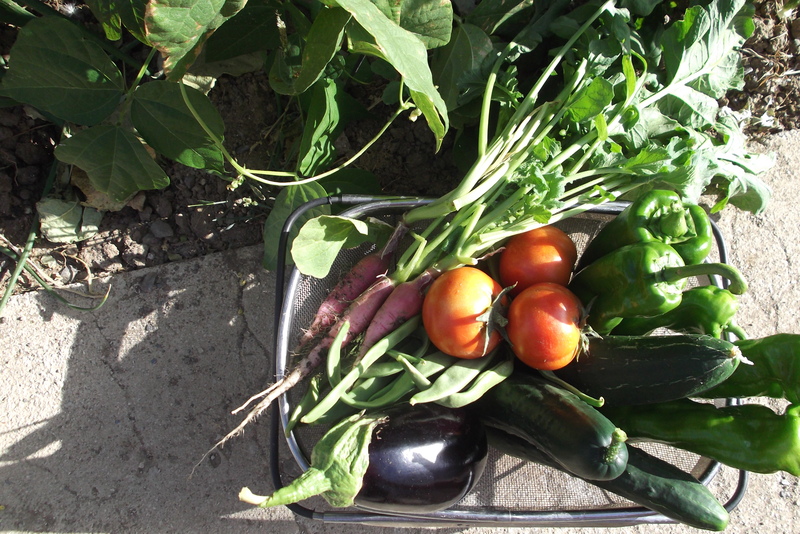 I can´t believe that I´ve been picking veggies and not bragging about it! Today we finally picked our first red tomatoes…hurrah! We were late planting, but now that they´ve kicked in, there will be no stopping us for quite a few months now. Am planning salads, sauces, sun dried tomatoes and goodness knows what else. My plum tomatoes (or roma) are getting huge, but still frustratingly refuse to turn red. Please do the decent thing and turn red soon! We planted 18 runner bean plants this year (as opposed to the totally ridiculous 60 last year) and have been picking them almost daily for about 3 weeks now. We´ve still got a way to go with them, but thanks to my nifty runner bean slicer, we´re enjoying beans and freezing them too for later. 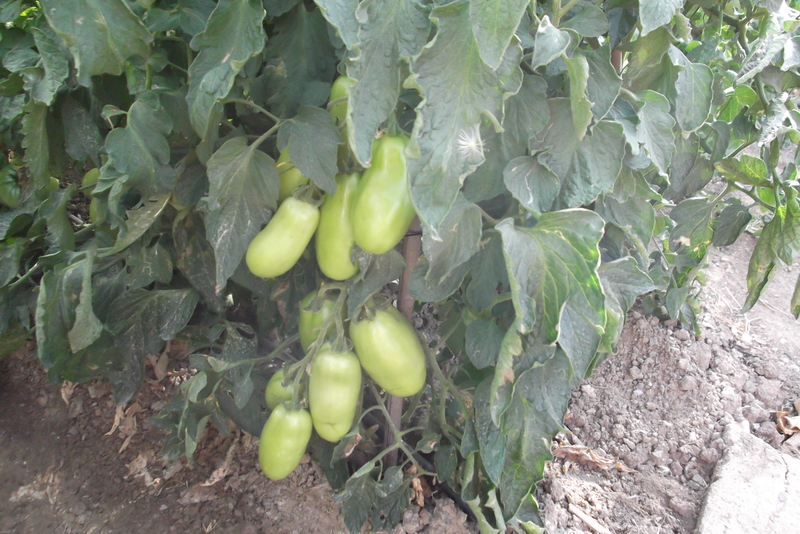 The aubergines are ripening and I´ve started to pick them quite small. Later I´ll leave them to get a little larger, but I couldn´t hold back. Our long thin green peppers which are great for gazpacho are now being picked every couple of days. They´re also wonderful deep fried (stuffed or not) in olive oil and just sprinkled with salt. Our bell peppers are growing well, but need some more time to get bigger and then red. 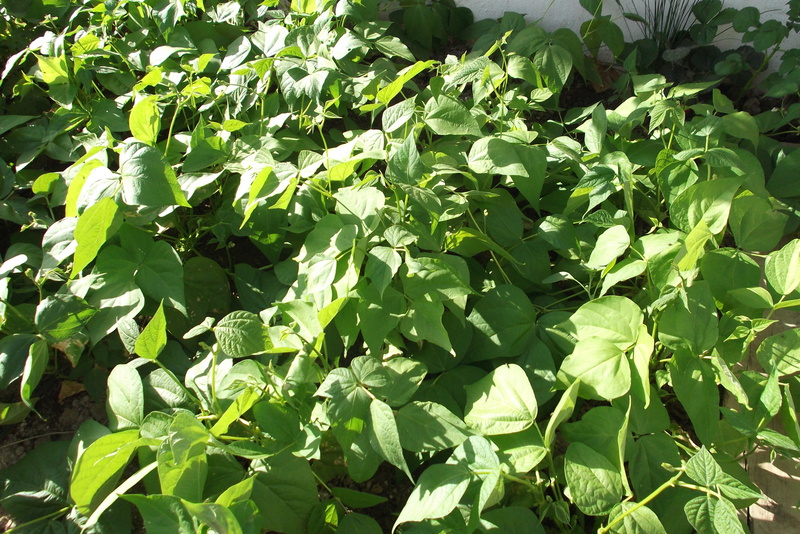 The dwarf beans we planted a couple of weeks ago are all in flower, so it won´t be long now until they´re producing little bobby beans for us. 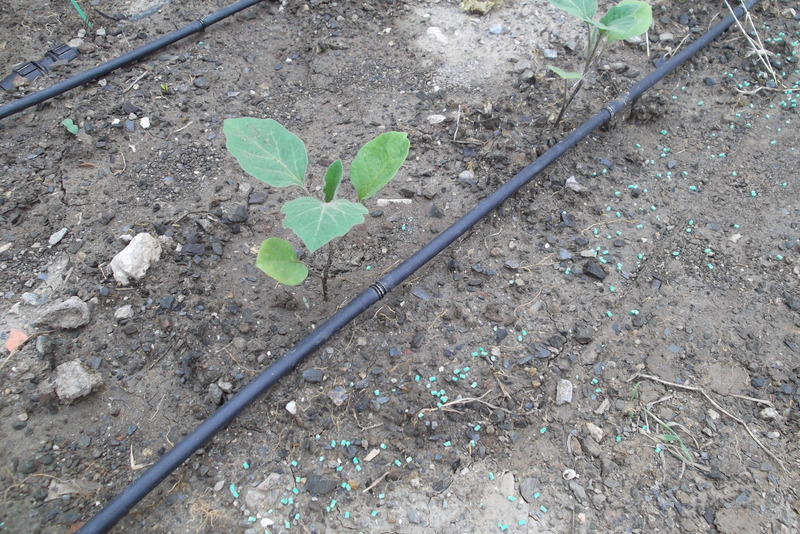 I´m quite excited as I´ve planted two varieties, one green and one yellow. I´m sure they´ll taste pretty much the same but they´ll look extra pretty! Our Spanish radishes, which are long as opposed to round, are doing great. We pick a couple each day and they have a good bite to them. We´ll probably plant a few more as they come up from seed so quickly. And our little Spanish cucumbers are doing well. We grew them from seeds from a cucumber we saved last year. The cucumber had come from plants that our neighbour Diego gave us from seeds of his own – so these are several generations old. It´s good to have a little bit of history in the garden! 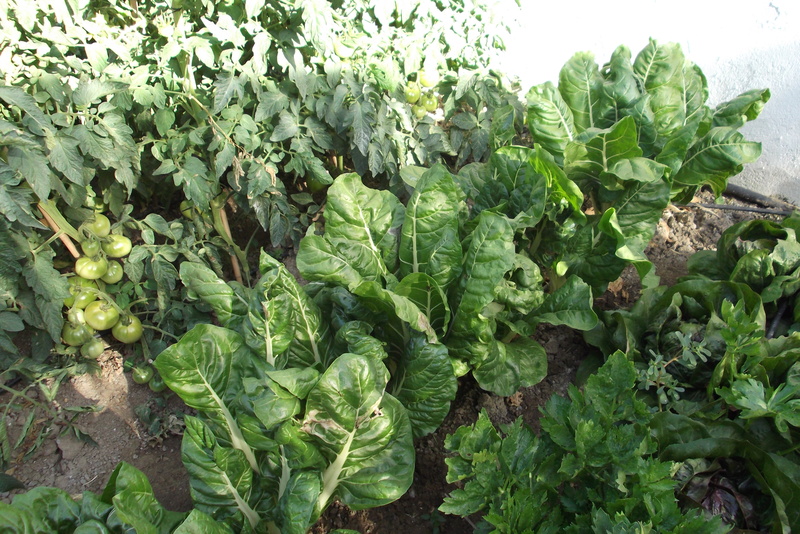 Our chard flourishes, I keep giving bunches of it away, but will do something this week with it for us. And our celery is slowly but surely getting bigger. We have other things going on in the vegetable patch, and I´ll take some pics as the become ready. I do have to mention our little vines. 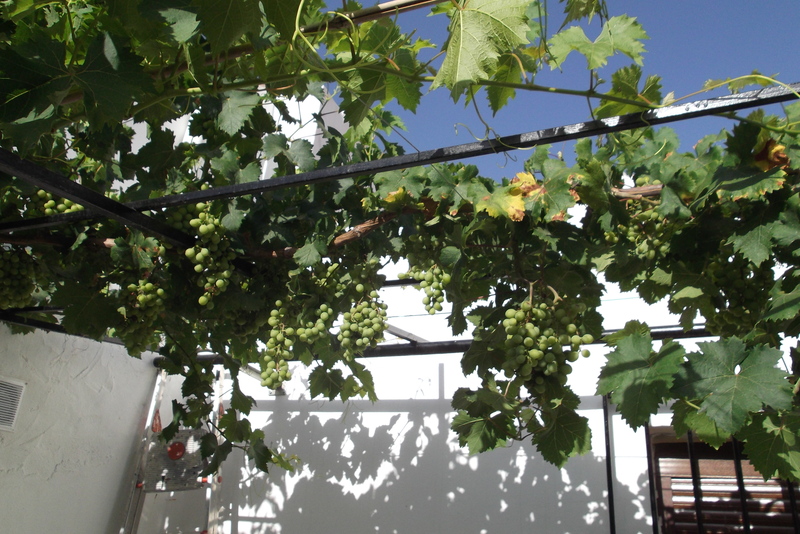 Big Man is very rightly proud of our muscat grapes which are now trained over the kitchen window. They look amazing, we had to remove some as we had so many bunches but they would never have all ripened. Am looking forward to grapes in September and drying some for Christmas too. 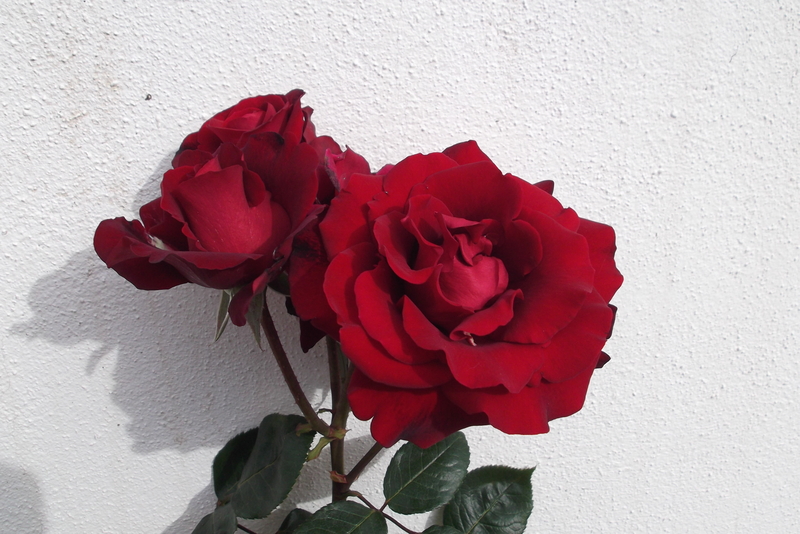 I love summer…but I´m off to water the garden soon as it´s very hot here during the day and the plants are thirsty. ¡Hasta luego! Before I start this quick post, I have to tell you that I´m having a giggle. The word cateto or cateta translates perhaps more literally as “Peasant”, but not in an offensive way. Before I started typing I just thought I´d do a quick translation check to see if there was another word I could use and all the on line translation tools, bizarrely come up with the word “leg”! Not quite sure what is going on there…but I decided to call it Country Salad. 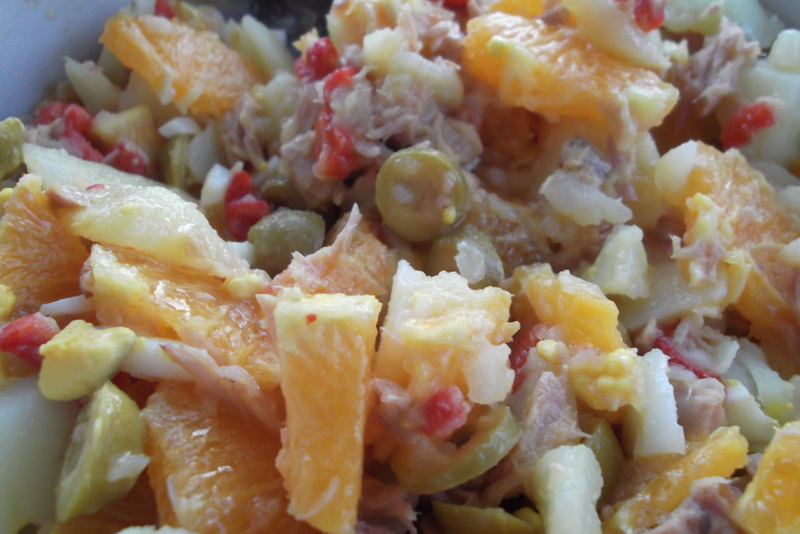 It´s another celebration of that most Andalucían of fruits, the orange. Again, typically a poor person´s salad it was originally made with salt cod as it was cheap and you didn´t need to use much. A few other bits of country produce like potatoes, peppers and olives, a good soak in olive oil and you were done. Of course, nowadays you can get all sorts of glorified versions, but the one I´m giving you here is the one you´ll find in all my local bars and homes around here. 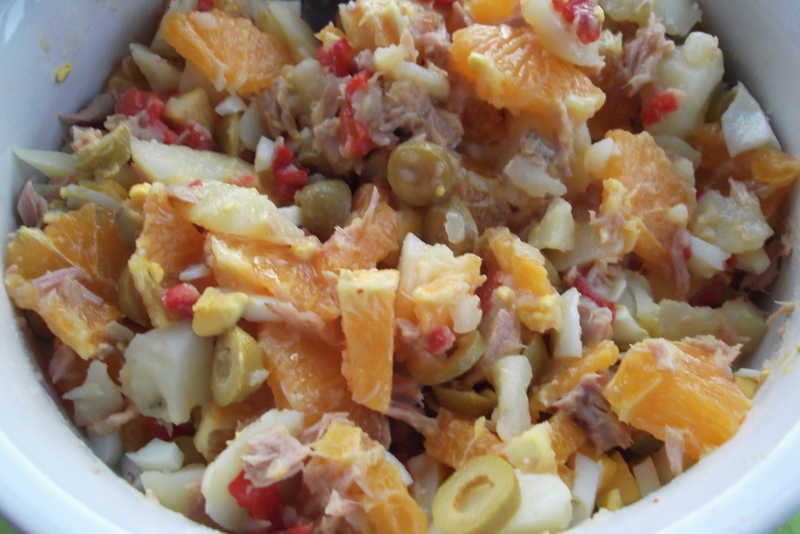 It´s served as tapas in bars, and as a light meal at home. Of course, some people make their own little tweaks, and why shouldn´t they? They might leave out the peppers and add tomatoes. Some people like tomatoes or onions in it, others don´t. And complete heathens, like me, sprinkle chopped fresh chili all over it to the amazement of their other halves….each to his own I say! A delicious serving of “Leg” Salad!! All you need to do it combine everything in a bowl, season and dress it and leave it for at least half an hour in the fridge so that the potatoes can soak up some of the lovely olive oil. Good to serve at a party or buffet as it can be prepared ahead and does not suffer from being forgotten in the fridge for several hours. Hope you enjoy it! It´s the end of May and we only got round to planting out all those little plant plugs on 21st May, shame on us. We´re usually at least a few weeks earlier, but never mind. The weather seems to be turning to summer, and I took a little look around this morning to see how things were doing. Five days on, and I couldn´t believe my eyes. Fortunately things catch up quickly here and I know, at least if the weather stays fine, we´ll be eating most of what we´re growing now into November. The runner beans seem to be growing a few cm each day. Luckily we have plenty of canes for them. We had to put down some slug pellets, not really in keeping with our organic aims, but there seems to be a plague of slugs and snails this year. 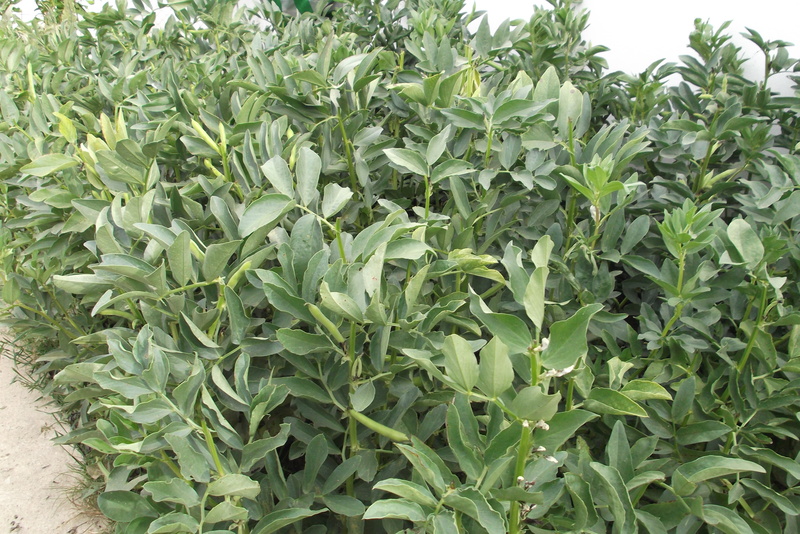 The broad beans are still in full production, the freezer is also well stocked for when they do die off in a few weeks. Beans, beans are good for you...! 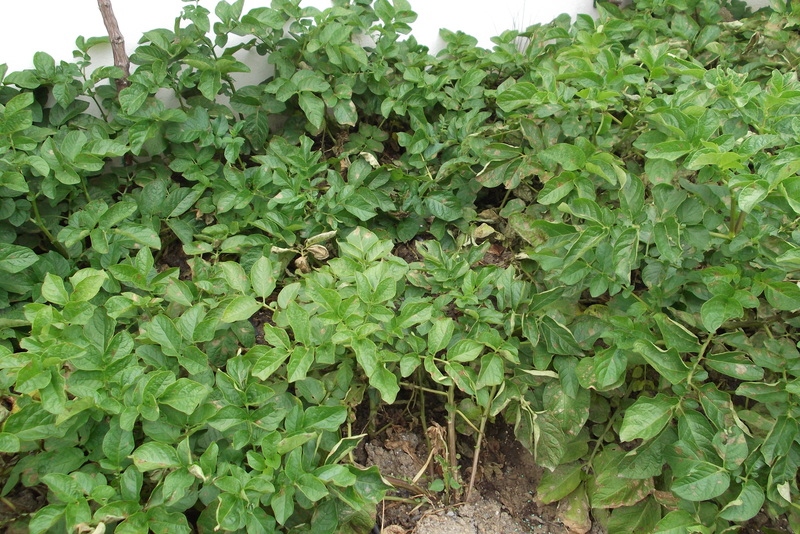 We´re very excited about our potatoes as we´ve never grown them before. Big Man was reluctant as they do take up a fair amount of space. 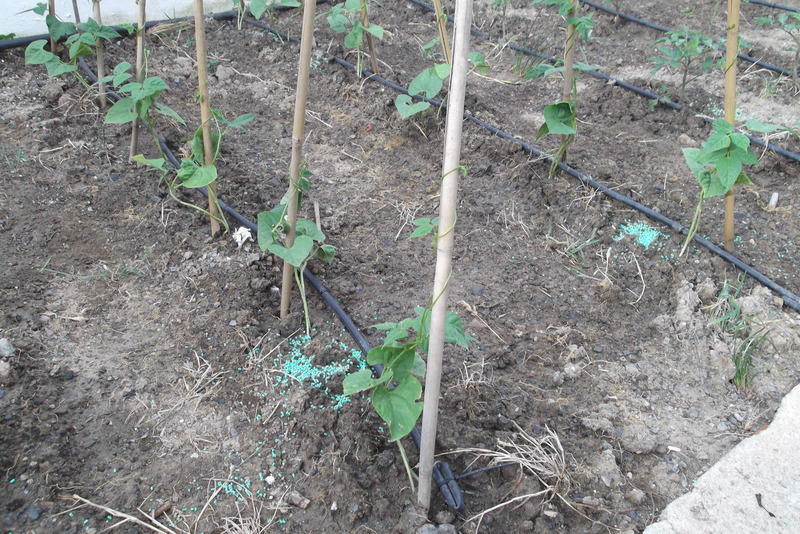 However, they´re drying out now and will be ready to dig up soon, then once we´ve dug over the soil and given it whatever (organic) feed it needs, we´re going to put other things in. I have seeds for dwarf runner beans (including some very funky yellow ones, which I´m quite excited about). We´ll definitely put some radishes in as they grow so quickly, and then some lettuces as choices here in the shops locally are mainly limited to lettuce hearts or iceberg. Tired Potato Plants - which is good! Last year a neighbour gave us some little cucumber plants which he had grown from seeds of his previous year´s crop. They went crazy and we had loads of delicious little cucumbers all summer long. We took his advice and saved the seeds from one cucumber which we let grow fat and sad looking. 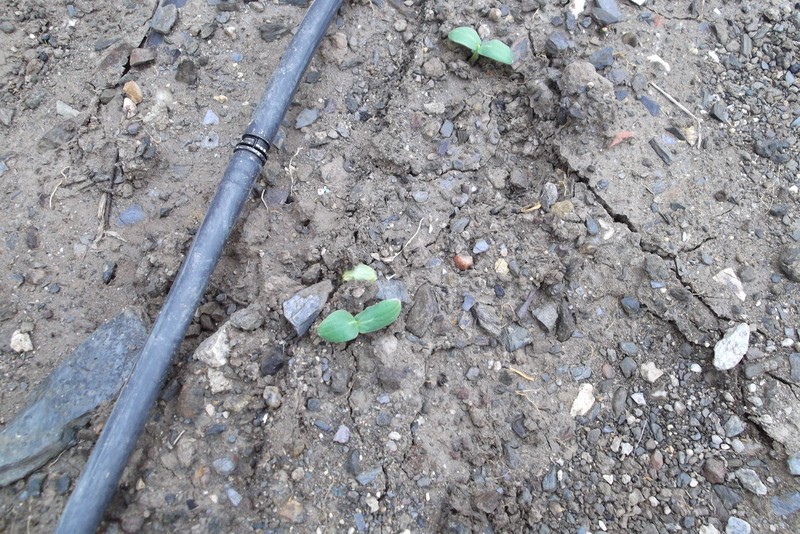 We planted them 5 days ago, and despite Big Man being convinced that nothing would come of them, this morning we found lots of little sprouts…we´re so proud! 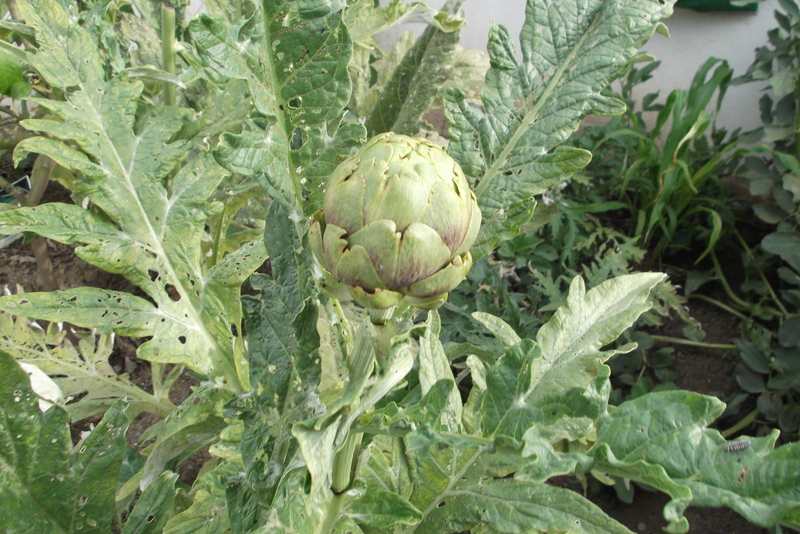 Our artichokes continue to flourish, but we will put some new plants in this year as the current ones are now three years old and getting tired. Our tomatoes, peppers and aubergines have taken root well. Big Man hates aubergines (or eggplants) with a passion. I, on the other hand, adore them. Sometimes I sneak them into dishes without telling him and he cant always tell. I love Melanzane Alla Parmigiana, and make this as a treat all to myself so we have planted a little row of them to keep me happy. Aubergines. Love ´em or hate ´em? And our lovely little lemon tree seems to have found its pace and keeps us supplied with juicy fruit for squeezing over grilled meats, making dressings and slicing into our “sun downers”. Ice and a slice anyone? 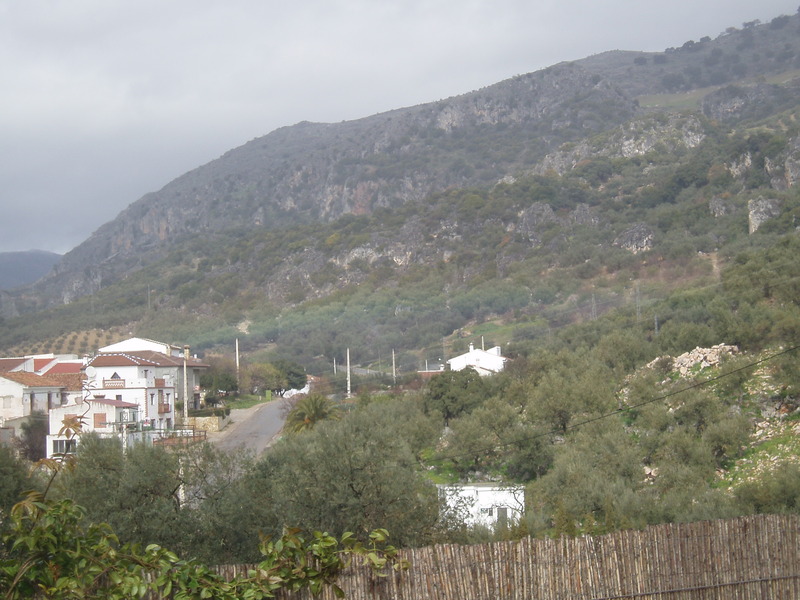 We´ve had some amazing mild, sunny February weather, but yesterday things changed and the rains came down. The temperature dropped and made me yearn for warming soups. I had bought a couple of kilos of red onions from a lady in the market a few days previously. They were probably home grown as she had a wheelbarrow full of them and nothing more. 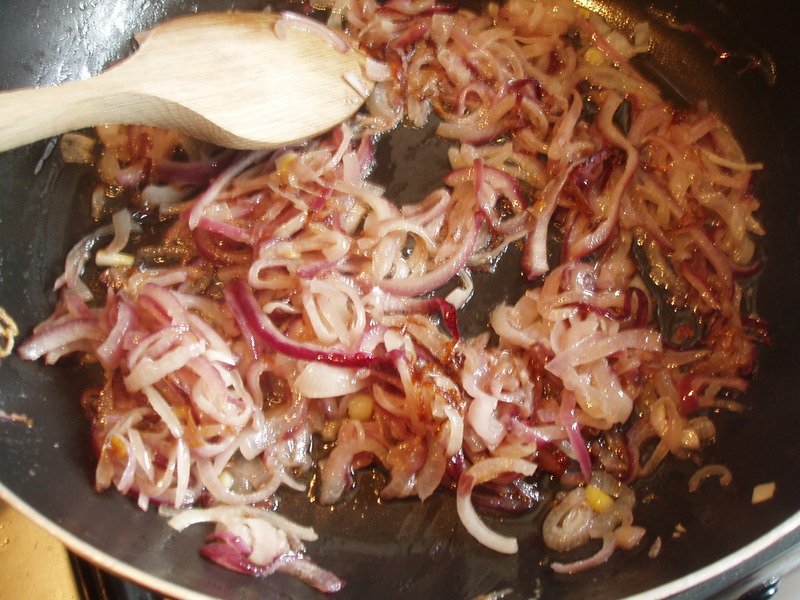 The onions were eye wateringly strong, as I had found out when I used some in a salad, so I thought that perhaps they would have a gentler flavour if cooked slowly in a chutney or soup. Memories of a romantic week in Paris with Big Man reminded me of French Onion Soup. I went to the top of the Eiffel Tower for him, despite a severe dislike for heights. After returning to ground level, pale, shaking and cold, we found a little bistro where we warmed ourselves up with Onion Soup and a bottle of red wine shared on one of those tiny Parisian Bistro tables which lend themselves to knees and hands touching over a romantic meal. It´s not a difficult dish to make. It´s cheap too, but needs a bit of patience. No rushing this one I´m afraid! First you´ll thinly slice those onions, then you´ll blow your nose, wipe your eyes and melt the butter with the oil in a large frying pan. 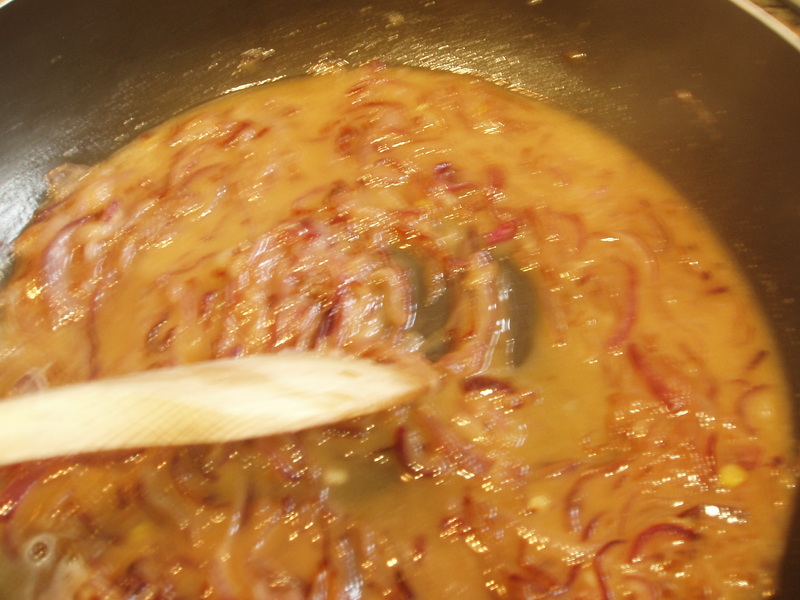 Add the onions, mix them around to coat them and turn the heat down to low. These will now cook very gently until they start to caramelize but still remain soft. This can take at least half an hour, sometimes double that. It just depends on the time of year and how much water the onions have. Stir them with a wooden spoon from time to time and when they start to turn brown, sprinkle the sugar on top and keep cooking until they are dark brown. This can take another 10-20 minutes. Now sprinkle over the flour and cook gently while stirring for a minute. At this point you can add your wine and then your beef stock (if you have it, but it´s very hard to buy good beef, let alone find beef bones to make stock in Southern Spain). I use chicken stock (if I have some made) otherwise water and a stock cube and I add a good teaspoon of marmite to give it a beefy taste. I know it´s salty, but you haven´t seasoned yet, and depending on how much salt you like to use, you can leave this part of the seasoning out at the end. 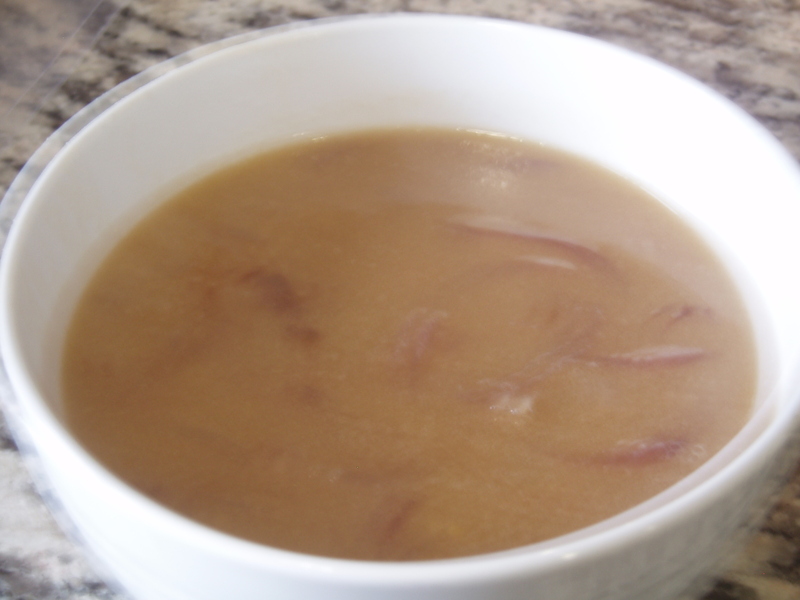 Today I used homemade chicken stock, and because our chickens are corn fed, my stock is very golden in colour. This means that unless I add loads of marmite to darken it, it won´t be as dark as it usually turns out. Too much marmite makes it super salty, so I live with golden coloured soup sometimes! Simmer gently for about 15 minutes and you´re almost ready to serve. Taste to check and add salt and pepper if you like. If it´s a touch sweet from the caramelized onions, I find a sprinkle of salt and a slug extra of white wine usually balances the taste out. If you like you can serve with little rounds of melted cheese on toast at the bottom of the soup bowl, or floated on the top, but what really gives it that extra warming hit is a small hit of brandy poured in just as you serve. Bon Appétit! Just as I finished making my soup, the sun broke through the clouds and rain, and I had a beautiful rainbow to look at and brighten my day. Lucky me, Onion Soup and a Rainbow – life can be full of the most unexpectedly lovely moments.